Often confused with C. chinensis, C. japonica is a small species belonging to the family Viviparidae. 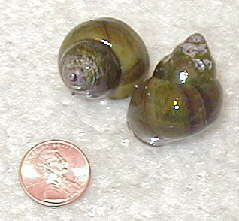 Like other Viviparids, they are live-bearing snails that require a male and female to reproduce. Adults of C. japnoica grow tup 1.5″, rarely larger. The shell has a distinct ridge running along the middle, sometimes with another ridge closer to the suture. C. japonica is a species that prefers cooler water, not exceeding 75F in temperature. Higher temperatures for a long period of time will sometimes cause this species to close up, stop eating, and even die.